Kim Blake is no stranger to the world of Martial Arts. 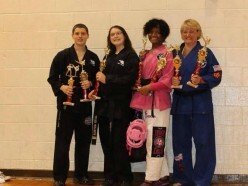 She has been an avid martial artist for over 11 years. She got her start in Karate and Kickboxing and transitioned to Jiu-Jitsu eight years ago. We are honored to have Kim hosting for the first time ever her home academy Apollo’s Martial Arts. We caught up with Kim to see what she has in store for us. How has BJJ contributed to your martial arts training? BJJ has enhanced my Martial Arts experienced by making it sound. I feel complete. I Know that if I am attacked I will most likely get knocked to the grown where I feel I could protect myself or win a battle even if it’s just for fun combative gaming. Do you think it is important for females to learn martial arts? I think it is very important, I think females should feel empowered and victorious and not weak and victimized. Which martial art would you say you’ve seen the most females training? I compete in stand up tournaments and in GI/NO Gi Grappling tournaments and I have more matches at these tournaments then I do at the Karate one. Do you think it’s important for females to train together? I do think that it is important to train together. Sometimes Men tend to either push women to much in training by overpowering them with their strength which makes them feel inadequate or give them a false sense of empowerment by letting the female easily overtake them the first time and tell them that they have done GOOD and clearly they have not. I think when women can train together and perfect their technique they can learn to cancel out the power of an attacker. When did you go to your first Girls in Gis event? What have you learned from your experiences as a GIG participant and as a host? I have made a lot of new friends with the same passion for the ARTS from way young to way ageless. We all rock and Encourage one another to continue, to be strong and to be ourselves. We are excited to have you be our host instructor. What do you have planned for the girls? We are a complete mixed martial arts academy. I hope to blend in some KETSUGO as well as ground technique. REGISTER FOR GIRLS IN GIS MIDWEST TULSA OKLAHOMA HERE!!! ← Girls in Gis Texas Austin April 26th!